A reader of my blog experienced problems setting no-export BGP community. Here’s a quick how-to guide (if you’re new to BGP, you might want to read BGP Communities and BGP and route maps posts first). FlipIT, our “Most Innovative Data Centre, Cloud and Virtualisation Project of the Year” (according to Cisco) IT-as-a-Service cloud solution/service is now shown on Cisco Marketspace, where it’s still one of very few cloud services solutions. Great job, the Flip-IT team! One of my readers sent me an interesting problem a few days ago: the BGP process running on a PE-router in his MPLS/VPN network preferred an iBGP route received from another PE-router to a locally sourced (but otherwise identical) route. When I looked at the detailed printout, I spotted something “interesting” – the pre-bestpath cost extended BGP community. IPv6 implementation in Time Warner Cable by their director of technology development: Lee Howard of the CGN-is-too-expensive fame. Enjoy! ... and thank you, Jan, for an excellent event. After Cisco acquired vCider in early October the content quickly disappeared from vCider web site. If the bombastic industry press claims how vCider acquisition represents Cisco’s response to VMware’s Nicira acquisition, and how it will “boost Cisco’s distributed cloud vision” left you confused, read my blog post from June 2011 to review what vCider was all about. For a more balanced view, read also Omar Sultan’s blog post. 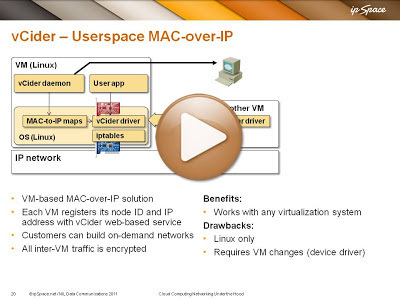 Finally, you might want to watch the description of vCider from my Cloud Computing Networking webinar. VXLAN is quickly becoming a technology worth considering in production deployments – there are two independent hypervisor implementations (Nexus 1000V and vSphere 5.1 vDS), and other vendors announced support for VXLAN hardware termination (Arista on 7150 ToR switches, Brocade on ADX load balancers). The upcoming VXLAN Technical Deep Dive webinar (register here) will give you a technology overview, some implementation and configuration hints, and (most importantly) design and deployment guidelines. IP multicast in the core network is a major component of the design puzzle and I’m delighted Mark Berly from Arista Networks agreed to present Arista’s hardware termination solution and IP multicast design guidelines. I agree with you that L2 DCI is like driving without a seat belt. But is L3 DCI safer in case of DCI link failure? Let's say you have your own AS and PI addresses in use. Your AS spans multiple sites and there are external BGP peers on each site. What happens if the L3 DCI breaks? How will that impact your services? Simple answer: while L3 DCI is orders of magnitude safer than L2 DCI, it will eventually fail, and you have to plan for that. Supposedly it’s a good idea to be able to identify which one of your users had a particular IP address at the time when that source IP address created significant havoc. We have a definitive solution for the IPv4 world: DHCP server logs combined with DHCP snooping, IP source guard and dynamic ARP inspection. IPv6 world is a mess: read this e-mail message from v6ops mailing list and watch Eric Vyncke’s RIPE65 presentation for excruciating details. During a recent consulting engagement I had an interesting conversation with an application developer that couldn’t understand why a fully redundant data center interconnect cannot guarantee 100% availability. I was talking about Cisco’s VSG in numerous webinars and presentations, but never managed to write a blog post about this interesting product. 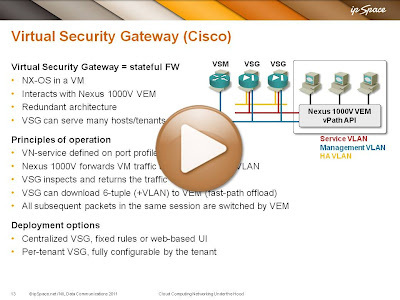 Let’s fix that, starting with a short video from the Cloud Computing Networking webinar. Some vendors feeling the urge to SDN-wash their products claim that the ability to “program” them through NETCONF (or XMPP or whatever other similar mechanism) makes them SDN-blessed. There might be a yet-to-be-discovered vendor out there that creatively uses NETCONF to change the device behavior in ways that cannot be achieved by CLI or GUI configuration, but most of them use NETCONF as a reliable Expect script. 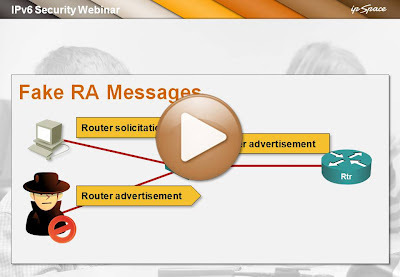 This video is a very short preview of what’s included in the IPv6 Security webinar (register here). Enabling IPv6 on a server LAN with the ipv6 address interface configuration without taking additional precautions might be a bad idea. All modern operating systems have IPv6 enabled by default, and the moment someone starts sending Router Advertisement (RA) messages, they’ll auto-configure their LAN interfaces. The cloudy and cold autumn weather is the perfect backdrop for marketing-related work. I finally managed to update the webinar roadmaps: overview, data center, virtualization, IPv6 and VPN. And yes, you get immediate access to all that (over 46 hours of content) with the yearly subscription. Not surprisingly, IPv6 has almost the same set of security problems as IPv4. Even worse, some of the things we’ve already solved in IPv4 (fragmented TCP/UDP headers) haven’t been ported to IPv6, and implementations of IPv6 security features lag far behind their IPv4 counterparts. The upcoming IPv6 security webinar (register here) describes these problems, and I managed to get the best possible guest speaker: Eric Vyncke (the author of the IPv6 Security Cisco Press book) will tell you all about the IPv6 security features available in Cisco IOS.